Update: sometime after this item was published, Microsoft fixed the bug discussed here that caused links to items on Microsoft corporate blogs to retun HTTP 404 (Not Found) errors when accessed with mobile browsers. 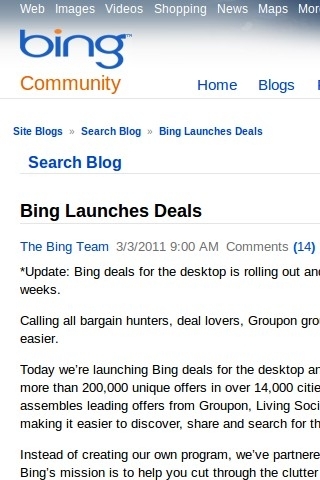 Last week Microsoft announced the launch of Bing Deals, a Groupon inspired feature of Bing Search. Created in partnership with The Deal Map, Bing Deals aggregates money saving offers in your area from Groupon, Living Social, Restaurant.com and other sites. The announcement was made on the Bing Search Blog. I first heard about it on Twitter where several of my Twitter friends posted a link to the announcement. I’m a compulsive bargain hunter and Bing Deals promised a mobile version so I clicked the link and landed – not on the Blog post or on Bing Deals but on a 404 “web page doesn’t exist” error page. What happened? Well the Twitter link was a short URL pointing at www.bing.com/community/site_blogs/b/search/archive/2011/03/03/bing-launches-deals.aspx. 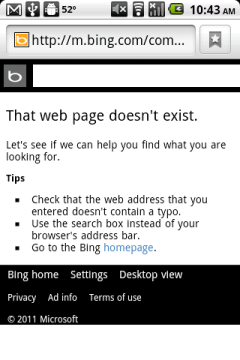 When I clicked that link the bing.com web app detected that I was using a mobile device and redirected me to m.bing.com/community/site_blogs/b/search/archive/2011/03/03/bing-launches-deals.aspx which doesn’t exist. Depending on which mobile browser I used I got either a 404 page (Android browser) or a soft 404 to the Bing homepage at m.bing.com (Opera Mini). I didn’t even see Bing Deals on the homepage with Opera Mini because the mobile version is only served to the Android and iOS browsers. Why is this bad? Microsoft launched a new service that has a significant mobile component. 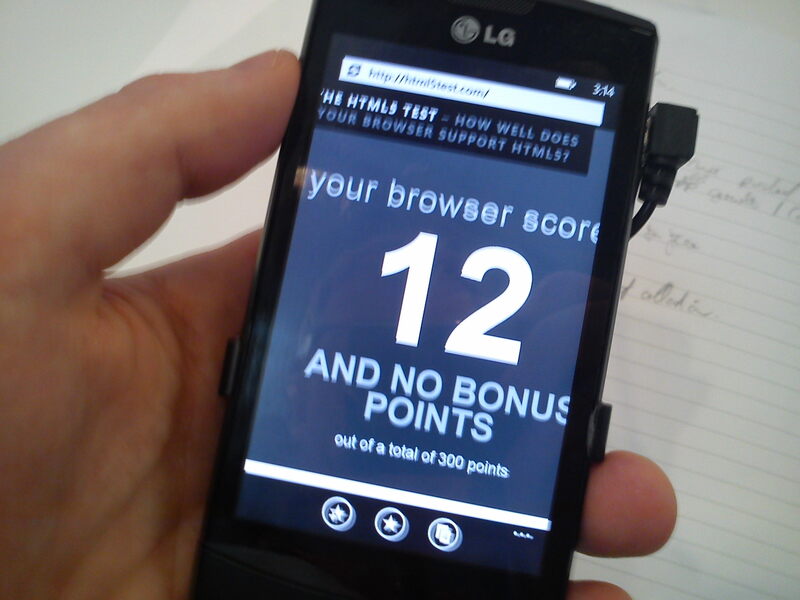 Much of the discovery of mobile sites and services is driven by the “real time web’ especially Twitter. Because of broken mobile browser redirection all the mobile “Twitter Juice” that the announcement generated was wasted and the experience left users once again wondering if Microsoft will ever “get” mobile? One of the core principles of the Web is Thematic Consistency, which means that a given URI should deliver content with the same essential meaning regardless of which browser is used. By redirecting mobile browsers from a page that most of them could render very well to a non existent mobile version of the page, Microsoft is breaking Thematic Consistency and undermining their own marketing efforts for Bing Deals. I also find it interesting that Bing Deals doesn’t work with Windows Phone. 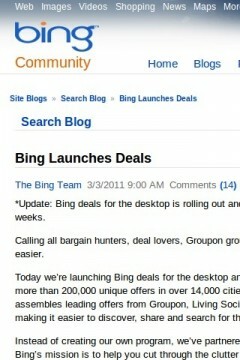 Comments by MS folks on the Bing Search blog say that’s because the Deals web app requires HTML5. It’s true that Deals is using he HTML5 geolocation API to localize the offers, but Bing also allows you to enter your location manually so it should have been possible to show the Deals listing (which is just a simple list of links) in all browsers. This entry was posted in Mobile Web Development and tagged Thematic (In)consistency Hall of Shame, thematic consistency by Dennis Bournique. Bookmark the permalink. The Deals app does use an HTML5 doctype and some HTML5 features including Local Storage (also not part of the core HTML5 spec) but its essential functionality (a clickable list of nearby offers) could have been achieved in a way that would work on most mobile browsers.